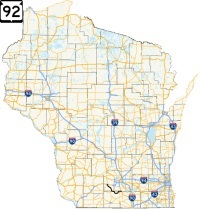 Quickie Summary: State “Trunk” Highway 92 is a minor state highway, but a pretty drive within easy distance of Madison. 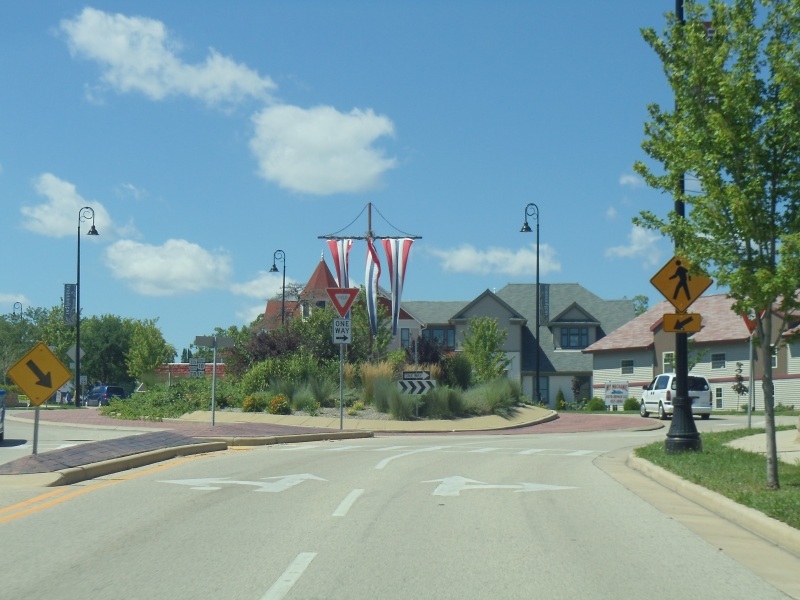 From Mount Horeb to Belleville, rolling hills and valleys dominate, along with plenty of farms and parks; to the east, more open scenery, Liberty Pole Hill and more greet you through Brooklyn to the end at U.S. 14. It’s a short route, perfect for a “no rush” afternoon. Highway 92 runs only about 30 miles, but in that short distance you get a nice variety of scenery and several nice towns to check out. 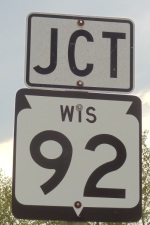 This sign, from County Highway A in Dane County, shows the “WIS” in the state sign, which was standard in the 1960s. Later signs phased this out in favor of just the number. 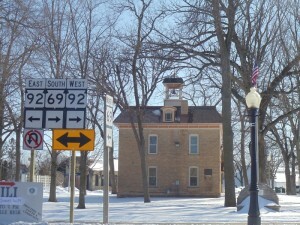 The Drive (North to South – really, a west north-west to east-southeast): Highway 92 begins at a roundabout on the east end of Mount Horeb (pop. 7,009 and “Troll Capital of the World”), where U.S. 18/151’s original route through town meets up with Highway 78. 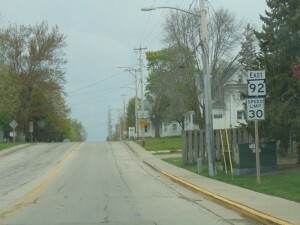 Highway 92 heads south as 8th Street, winding through residential neighborhoods and past Mount Horeb High School. 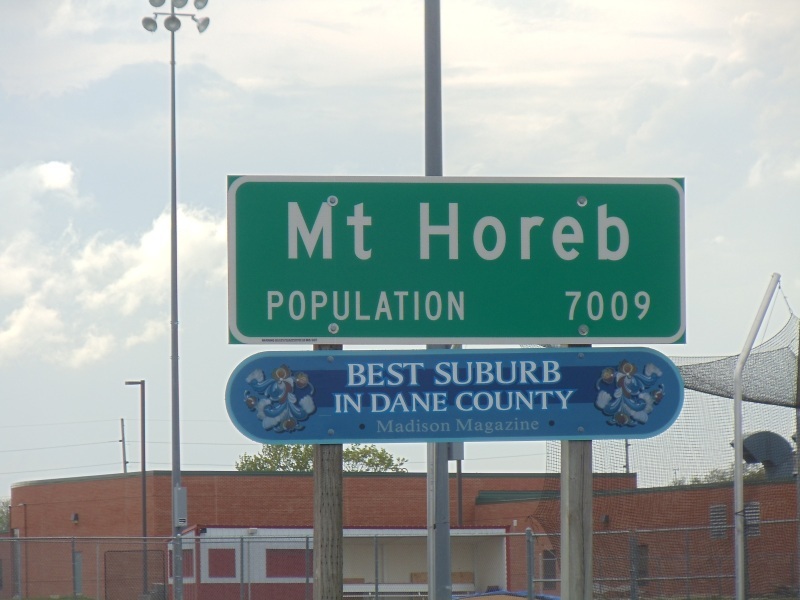 But you shouldn’t head out before checking out Mount Horeb itself. Trollin’ The Trollway. Mount Horeb is a charming town with a strong Norwegian heritage. And trolls – lots of trolls. Trolls line the main street (which is called “The Trollway” and is part of Highway 78 & Business U.S. 18/151, which Highway 92 meets on the east end of downtown) and have names like the Chicken Thief, the Accordion Player, the Peddler and one called “Little Pisser” for reasons we won’t get into. The Trollway is also home to a wide variety of shops and B&Bs. Brewpub Alert. Just off the Trollway, a few blocks west of Highway 92, is the Grumpy Troll. Their brews include the Amnesia Baltic Porter, which won a Gold Medal at the World Beer Cup. That’s just the latest in a long line of awards they’ve won, since previous awards have been bestowed upon their English Brown Ale, Trailside Wheat (probably named after the nearby Military Ridge Trail, I’ll get confirmation on another visit), Norwegian Wit, Curly Scotch Ale, Spetsnaz Stout and Maggie Imperial IPA. 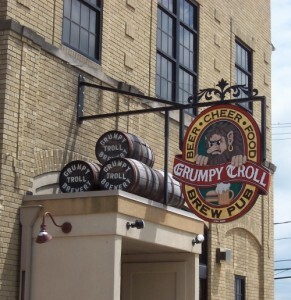 It was also rated one of the 50 Best Brewpubs worldwide for 2008, a distinction held by only one other in Wisconsin. Growlers are a popular way to take the beers to go. They also have a $5 martini menu featuring items like the Cosmi-troll-itan and the I’m Just Happy To See You, which involves banana (inquire further when you go.) Tours are available by appointment by calling 608-437-2739. 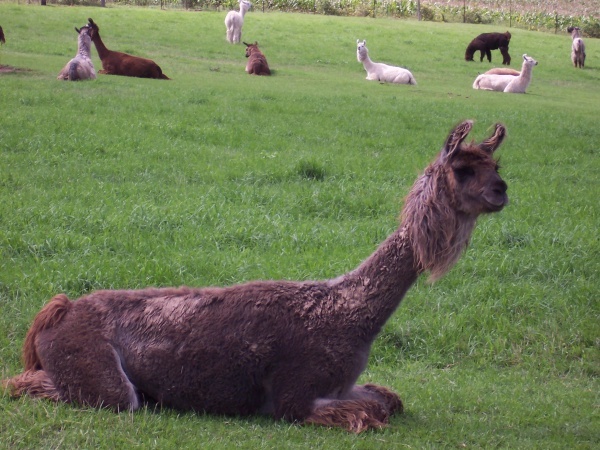 Heading into Mount Horeb, alpacas and llamas were spotted, some available for sale. They’re fun to look at, and seemed to enjoy the view on a nice, relaxing Saturday. 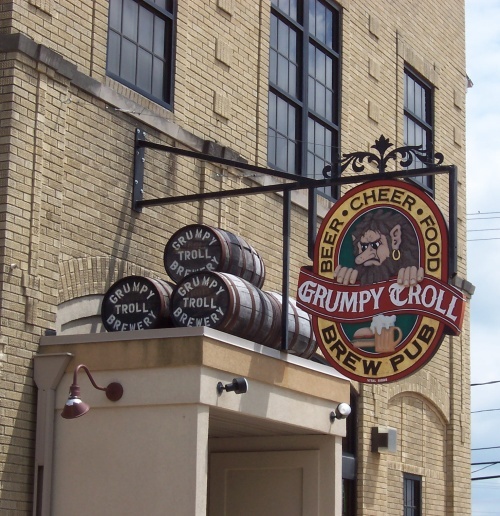 Just west of Highway 92 on Second Street in downtown Mount Horeb is the Grumpy Troll, a great stop for local brew, sandwiches and occasionally some good bands. Especially on a nice day when people play guitar out front, Dee’s Cheese ‘N More is a nice little stop along Main Street (Highway 78). Inside the store is a very Wisconsin experience, chock full of ice cream flavors, cheeses, sausages and more to choose from. Another nice little stop is Dee’s Cheese ‘N More (504 E. Main, 608-437-DEES), a cute little store featuring over 90 cheese varieties, ice cream from UW-Madison’s Babcock Hall, sausages a’plenty and other sundry treats. Does your back hurt? First tip: don’t drive with your wallet in your back pocket… it can throw off your back’s alignment. Second tip: a chiropractor might help, and Mount Horeb actually has the largest chiropractic clinic in the United States, the Gonstead Clinic of Chiropractic. It’s on the east side of town along Business U.S. 18 & 151, just past the roundabout on the east end of town where you also intersect Highway 78, which heads north from here towards Black Earth. Meanwhile, Highway 92 heads south for a nice drive into the countryside. 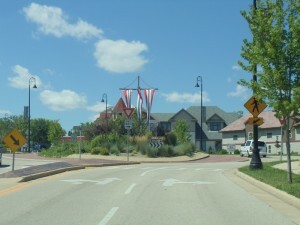 The main roundabout in Mount Horeb, on the east side of town. Highway 92 begins here, heading south; Highway 78 enters from the west and heads north, while Business U.S. 18/151 heads east-west through this decorated rotary device. From Mount Horeb, just past the high school, Highway 92 ducks under the U.S. 18/151 bypass (there’s no interchange access) and immediately begins threading through the countryside. Highway 92 begins as a residential street in Mount Horeb; it’s pretty much the only state road that doesn’t have an interchange with the U.S. 18/151 freeway, although it begins where the Business (read: “Original”) U.S. 18/151 still exists. Here’s the underpass; and as you can see, it’s a countryside drive beyond it. 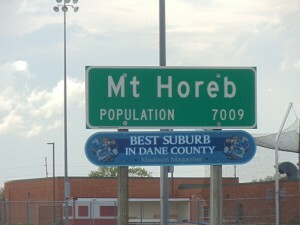 Right away after Mount Horeb, you feel miles away from anywhere. You’re basically in the Sugar River Valley, where the 480-acre Donald Park can be found. 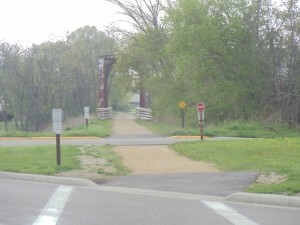 The park marks the headwaters of the Sugar River, which runs south through several towns Highway 92 enters before flowing towards Monticello, Brodhead, and Illinois. You’re twisting and turning a bit through the valley, past quite a few old family farms – some of which literally date back to the 1850s. 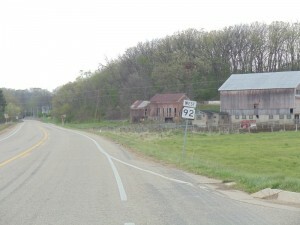 After about 7 miles, Highway 92 reaches the tiny burg of Mount Vernon (unincorporated). 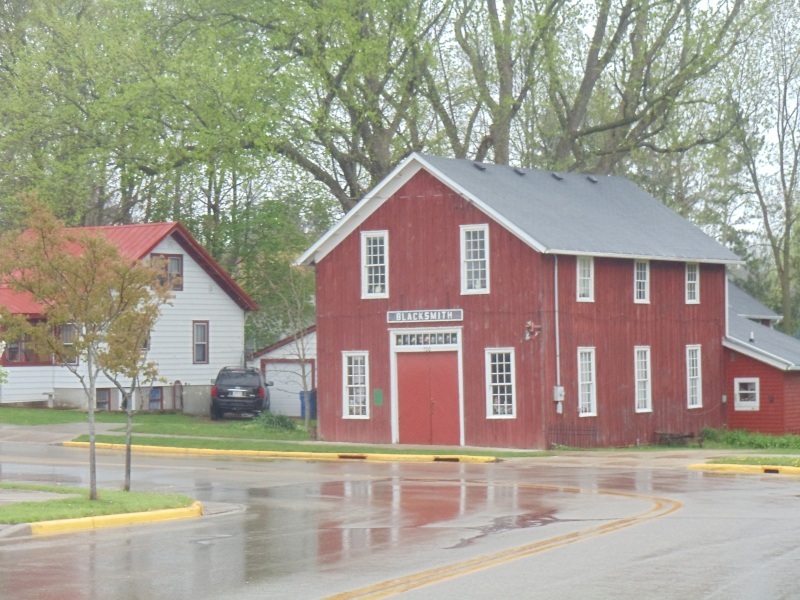 The town was originally settled around 1846 and grew around a grist mill while also serving as a stopping point for miners hauling lead from southwestern Wisconsin to Milwaukee. Mt. Vernon’s history includes a controversial time in the 1850s, when a Dr. Philander Byam and his two brothers bought up land in the town. They came to be infamous for their fraudulent business dealings, selling worthless “patent rights” to local farmers and marketing the settlement in New York State (where most new settlers to the area were coming from in those days) using false and misleading sales materials. One showed a picture of Mount Vernon as a settlement larger than it was, complete with a steamboat on the Sugar River – which is barely 20 feet wide and 2 feet deep around Mt. Vernon. In 1859, a group of residents fed up with such dealings proceeded to Dr. Byam’s residence. When his wife falsely claimed that he was not at home, they began to tear down Dr. Byam’s house until he eventually came outside. The Byams were given 24 hours to leave, or be hanged. They chose the former, and moved to Madison. (Want the complete story? It’s available here). Today, Mt. Vernon is home to a few hundred people, a few taverns and businesses, and one tree remnant that looks like Bart Simpson. 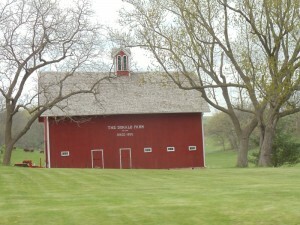 Some family farms along Highway 92 have been around for over 150 years. 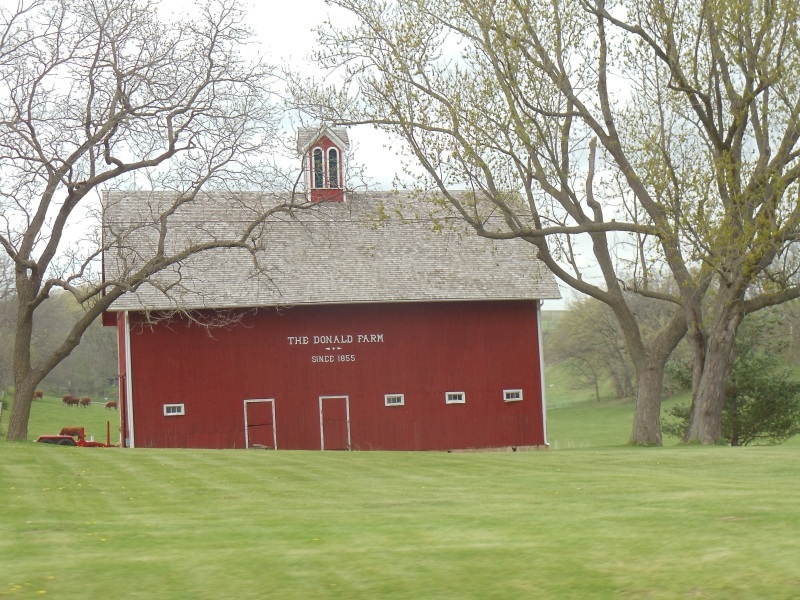 The Donald Farm (a family, not “The Donald” as in Trump) established in 1855 and still farms this land. From Mt. 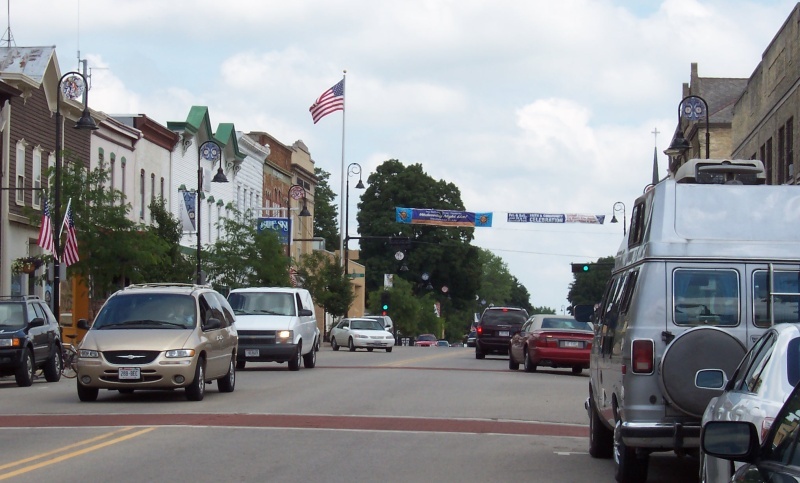 Vernon, Highway 92 opens up into more expanses of farmland and some of the rolling hills that mark this area, which is the eastern edge of the “Driftless Zone”, the sections of Wisconsin, Iowa and Minnesota that the glaciers missed in their mission to flatten most of the Midwest. Nestled in these hills and valleys are plenty of farms (left). Along some ridges, you can see for quite a distance, taking in the topsy-turvy topography that characterizes southwestern Dane County. 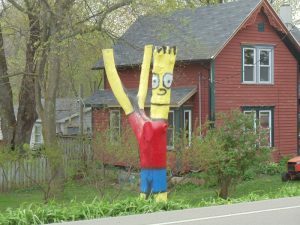 All this time, you’re within 20 miles of Madison. 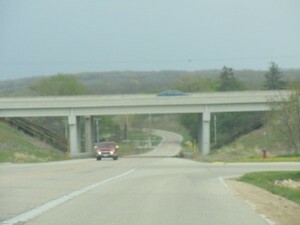 Once you hook up with Highway 69, Highway 92 heads east into Belleville (pop. 1,908). When this area was considered the “frontier”, American statesman Daniel Webster owned land right in town, which was then part of Michigan and then Wisconsin Territory. By 1850, the area was named “Belleville”, after Belleville, Ontario, the original hometown of early settler John Frederick. 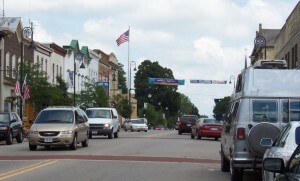 Today, Belleville spans the Dane-Green County line, although the downtown strip (which Highway 92 follows along with Highway 69) is in Dane County. 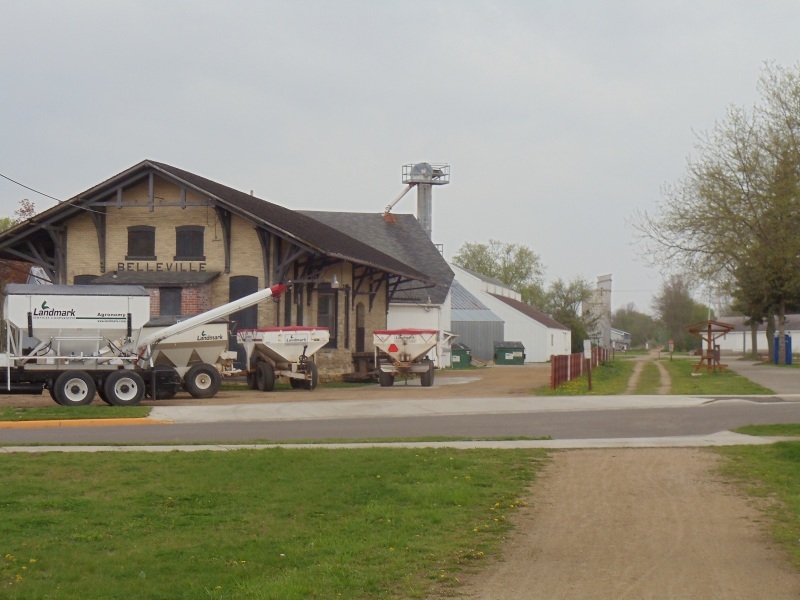 The village grew up around the old Illinois Central Railroad; its path lives on today as the Badger State Trail, which runs from Fitchburg in the Madison suburbs down to Freeport, Illinois. Belleville has hosted, off and on, a blues and American music festival called BamFest; it’s also big on unidentified flying objects. Being self-billed as the “UFO Capital of the World”, the annual UFO Day Festival & Parade takes place every October, usually on the last Saturday. Why a UFO festival? It all started with some sightings in 1987… you can read more here. 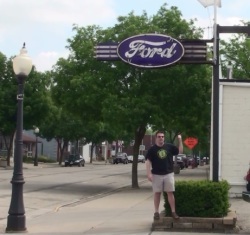 This Ford logo is a neon sign that dates back fifty-plus years. Classic car buffs love classic car signs often as much as the cars themselves. Today’s Ford dealer in Belleville is just down the street. 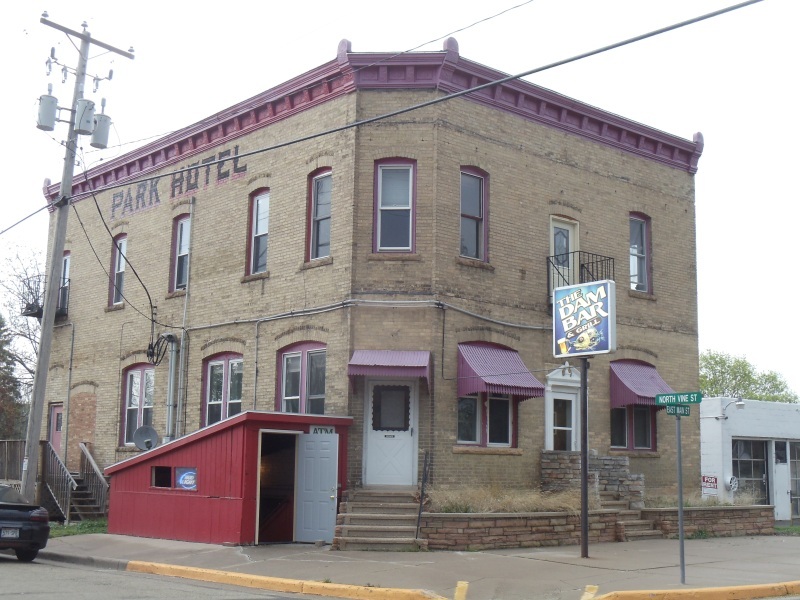 Once a hotel for weary travelers, the Dam Bar & Grill (3 E. Main, 608-424-9600) is named not for the cursing term, but for the nearby dam of the Sugar River that forms Lake Belle View, just north of downtown. 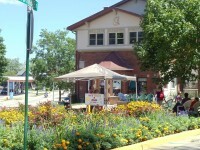 Where Highways 69 and 92 meet up in town, you can see Library Park, which surrounds Belleville’s original Village Hall. 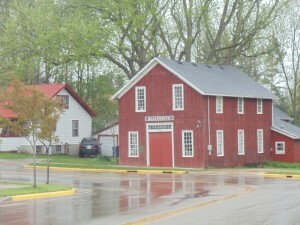 The charming little 1894 structure has a small bell tower on top and is on the National Register of Historic Places. 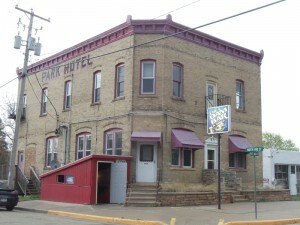 The downtown area has a lot of cool older things to check out. Once the railroad through town, this beaten path is now the Badger State Trail, which extends from Fitchburg to the Illinois State Line. Looking north, you can see one of the original railroad bridges; to the south is Belleville’s former train station. Further south is a 1,200-foot tunnel. Highway 92 winds through some residential streets in Belleville before turning south into Green County. After about two miles you bend east again through the hamlet of Dayton (unincorporated), where you cross the Sugar River again and proceed east until Highway 92 curves at Liberty Pole Hill. You’ll notice because it’s not only a hill, but one with a large American flag waving – and a history. Liberty Pole Hill dates back to the Civil War era. Being one of the highest points for miles around, affording a view of portions of Dane, Rock, and Green Counties, a log cabin was built here to serve as a recruitment center for the war effort. 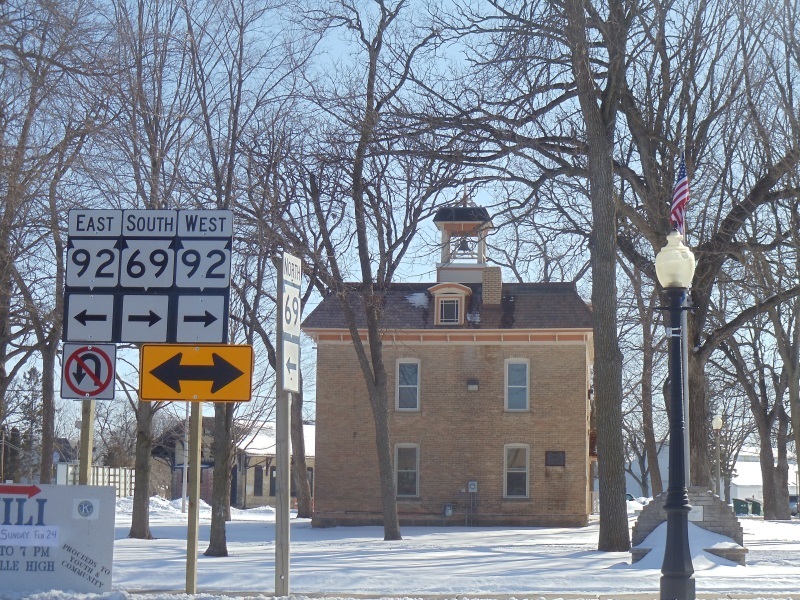 Hundreds of area residents came here to enlist and then marched to nearby Janesville to depart for the battlefields of the Civil War – many did not return. 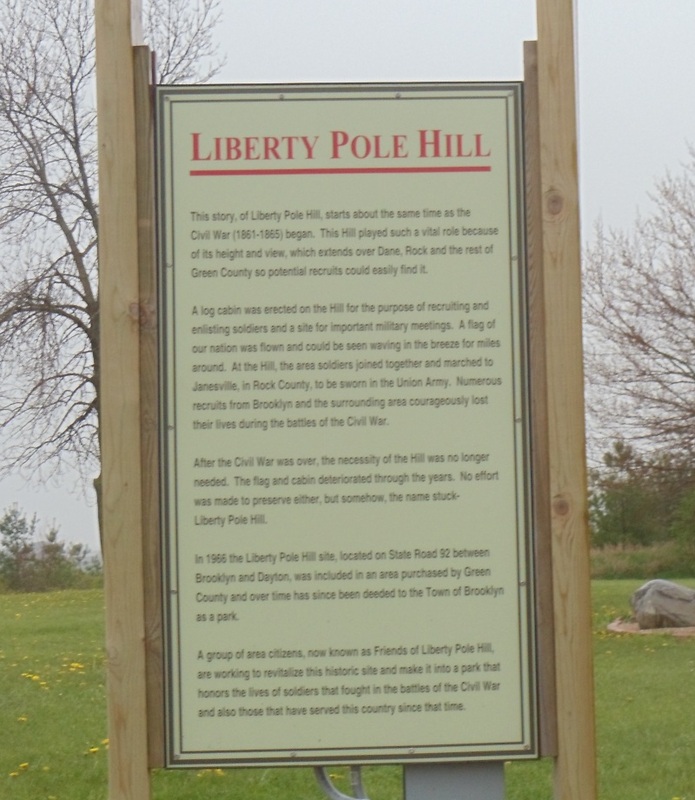 The original flag and log cabin have long since vanished, but the name for this hill stuck, and the new flag now flies proudly on top of Liberty Pole Hill, which is now a county park. Zigging and zagging back north and east a bit, Highway 92 enters little Brooklyn (pop. 916). Incorporated in 1905, Brooklyn sports a lot of tasty little cafes and hosts an annual event called Depot Days. The original Chicago & Northwestern rail line is abandoned, but many of the original buildings that served the trains, freight and passengers of the era still stand and are being used for other purposes. 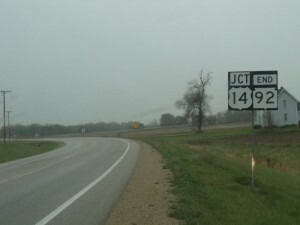 Like Belleville, Brooklyn straddles a county line – in this case, the Green-Rock County line, which Highway 104 follows south from town beginning at Highway 92. As Highway 92 winds through Brooklyn next to the old railroad, former buildings retain charm and adapt to new uses – although their original tenants may be indicated by some signage. After a brief but enjoyable jaunt (even on a rainy day such as this), Highway 92 ends at U.S. 14. Connections to other roads are quick and easy. 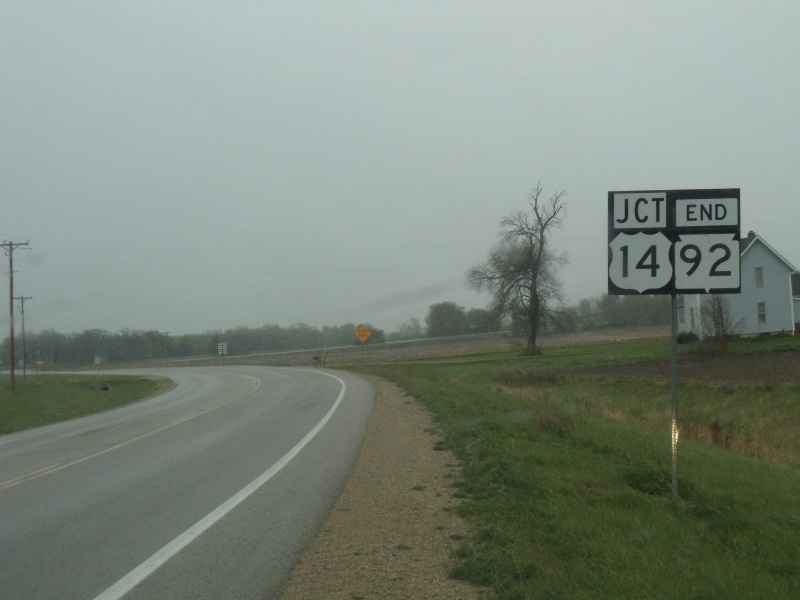 On the east end of Brooklyn, Highway 92 ends it brief journey at U.S. 14, a major thoroughfare that goes north to Madison (eventually, Wyoming) and south to Janesville (eventually, Chicago.) For a short ride, you get to take in a lot of what Wisconsin’s rural towns and scenery has to offer. Enjoy!